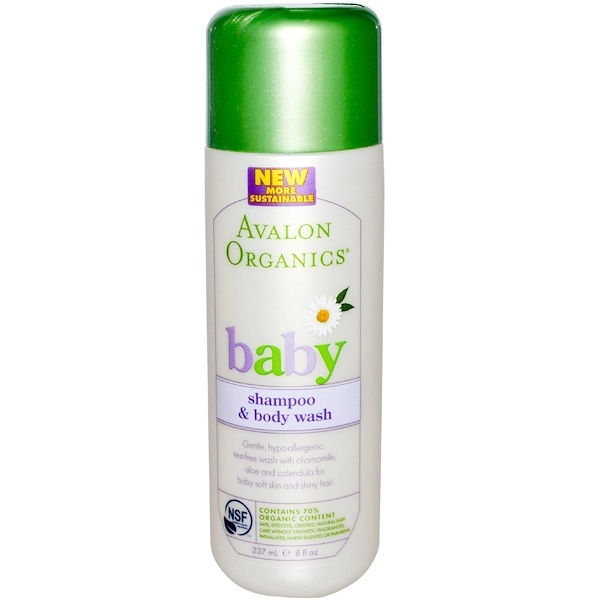 Safe, effective, certified, natural baby care without synthetic fragrances, phthalates, harsh sulfates or parabens. Soft bubbles, warm water and a parent's tender care make every bath a special bonding time between parent and baby. Free of chemicals and harsh sulfates, our paraben-free, foaming cleanser lets you rest easy knowing you are treating your baby's delicate skin and hair with the utmost care. This calming, tear-free formula is enriched with soothing and hyddrating sunflower and chamomile for shiny, healthy hair and a clean, happy baby. Babies love bath time - soft bubbles, warm water and a parent's tender care. Gently wash baby's delicate skin and hair with our natural, sulfate-free, foaming cleanser for daily, head to toe bath care. This soothing tear-free formula is enriched with organic sunflower oil and organic chamomile for shiny, healthy hair and a clean, happy baby. Apply a small amount of gel to damp palm or cloth. Work into creamy lather over baby's damp skin and hair, then gently rinse. Or pour a small amount into running water for a bubbly bath. Aloe barbadensis leaf juice(¹), aqua (water), sodium coco-sulfate, decyl glucoside, sodium chloride, glycerin, lauryl lactyl lactate, arnica montana flower extract(¹), avena sativa (oat) bran(¹), calendula officinalis flower extract(¹), camellia sinensis leaf extract(¹), chamomilla recutita (matricaria) flower extract(¹), lavandula angustifolia (lavender) flower extract(¹), citrus aurantium dulcis (orange) peel oil, citrus bergamia (bergamot) fruit oil, citurs limon (lemon) peel oil, helianthus annuus (sunflower) seed oil(¹), beta-glucan(¹), citric acid, sodium sulfate, alcohol(¹), potassium sorbate, sodium benzoate, limonene. No parabens, harsh preservatives, synthetic colors or fragrances, phthalates, sodium laruyl or laureth sulfate. 100% vegetarian ingredients.